So even though I have a ton going on right now (including starting my new job tomorrow morning! ), the first thing I thought when I woke up this morning was, “what am I going to wear on Thanksgiving? !” My first instinct was to head to Amazon, ASOS or the mall to find an outfit (because, instant gratification and 2-day shipping). But honestly, that is such a bad habit! It’s not practical or savvy to go shopping for an outfit EVERY time you have an event, but I’m definitely guilty of doing it. I’m trying to save money because the holidays (and my birthday!) are coming up, so I decided to head to my closet to explore my options. Shopping your closet is something everyone can do. It’s easy, fun and most importantly FREE. 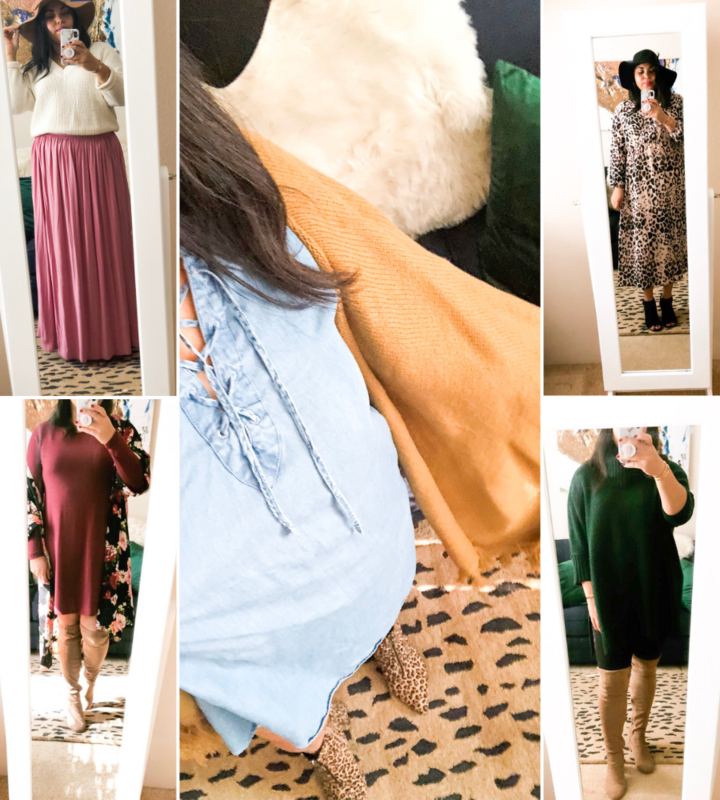 I actually found so many things I completely forgot I had and came up with some really cute outfits that I can wear on Thanksgiving day and beyond! 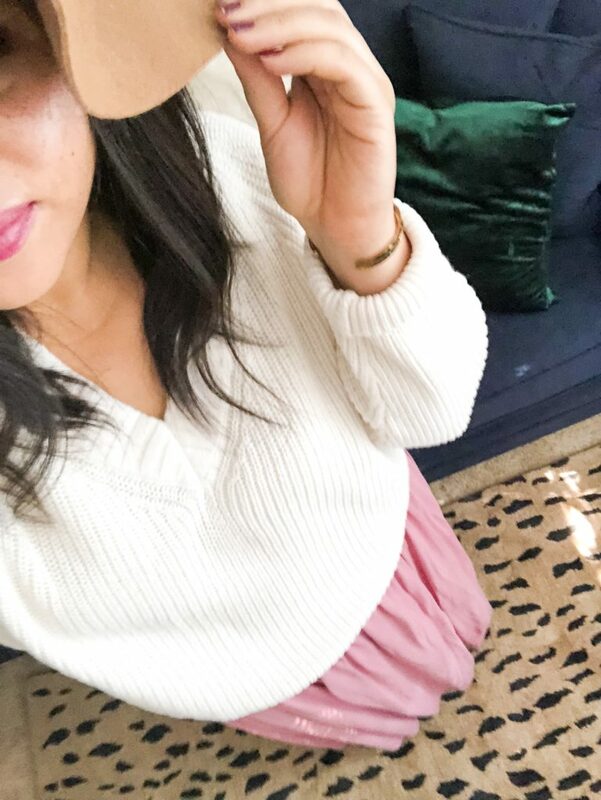 If you’re still scrambling to figure out what to wear to your Thanksgiving dinner or brunch and need some outfit inspiration, then this post is for you! 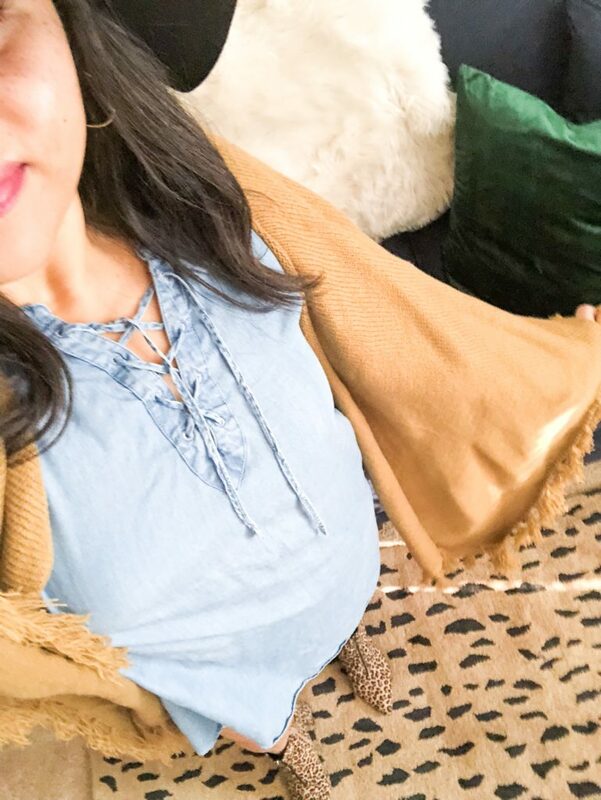 I was able to put together FIVE adorable (and comfortable) fall outfits by shopping my closet + accessorizing, and I guarantee you have some or all of these pieces in your closet that you can play with to put together the perfect outfit, too. I did videos showcasing all of these looks over on my Instagram stories- you can find them under my “Thanksgiving outfits” highlight (see here). 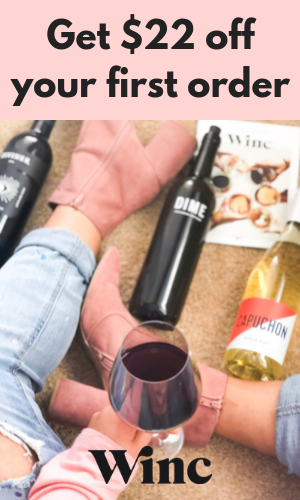 PS- if you need wine recommendations for Thanksgiving or Christmas, check out this post. 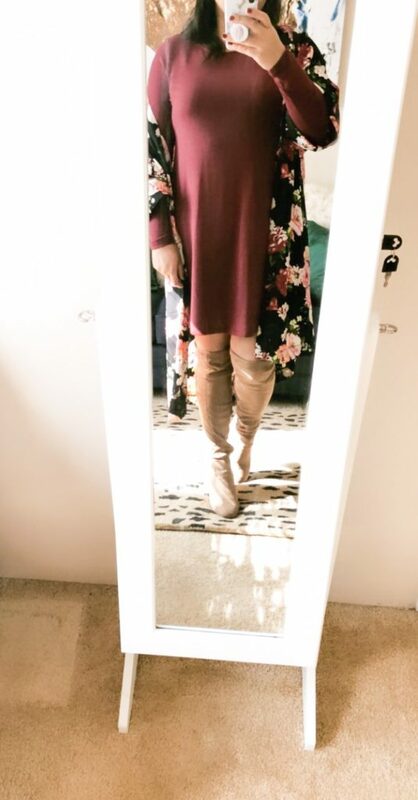 For this look, I took a very old long sleeve jersey dress, layered it with my favorite floral print kimono (seen here) and finished it off with a pair of OTK boots. I hadn’t worn this dress (but it’s one of my favorite layering dresses that I own in over 5 colors) in months and was actually about to sell it on my Poshmark account. If you have any older long sleeve dresses, consider pulling them out and pairing with your favorite kimono, scarf or poncho for a fresh look. The OTK boots work nicely with this look and will keep you nice and cozy in case it’s cold in your neck of the woods. If you follow me on Instagram, then you know I love to wear this short sleeve chambray dress (styled here and here). An easy way to repurpose your summer dresses is to layer them with a poncho, cape or cardigan. The leopard print booties added a fun fall element (here are 35 more leopard print pieces to shop), and the black felt hat tied it all together. 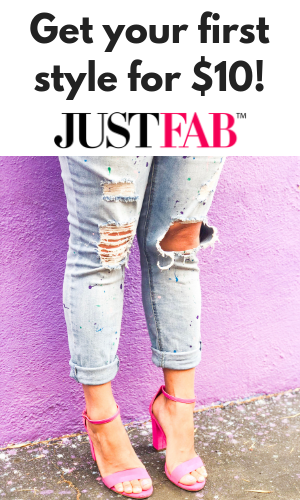 Don’t be afraid to pair some of your summer faves with your fall pieces! Leggings should be the official apparel for Thanksgiving, am I right? They are comfy, stretchy (so you can eat all the things) and can look totally chic if styled properly. 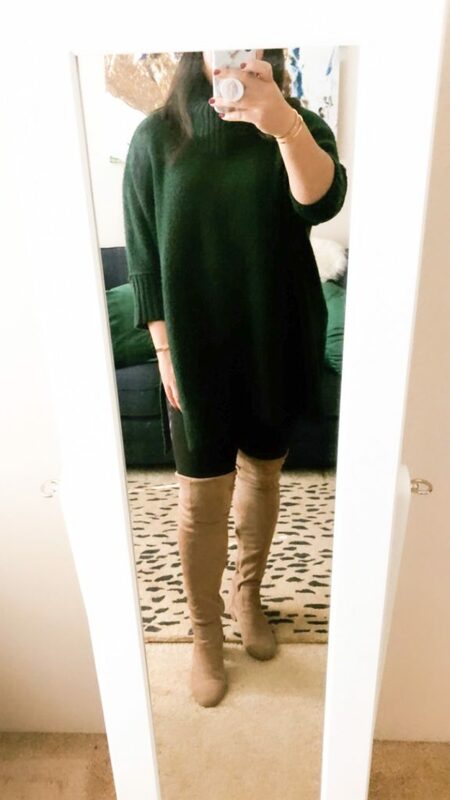 To give your leggings a more sophisticated look, I love to pair them with a long and chunky sweater (make sure it hits mid-thigh) and OTK boots (or booties). You’ll want to choose a pair of high-quality leggings (like these ones) so that they are not see-through, and they can keep you warm. We all have a maxi dress and a sweater in our closet, right? 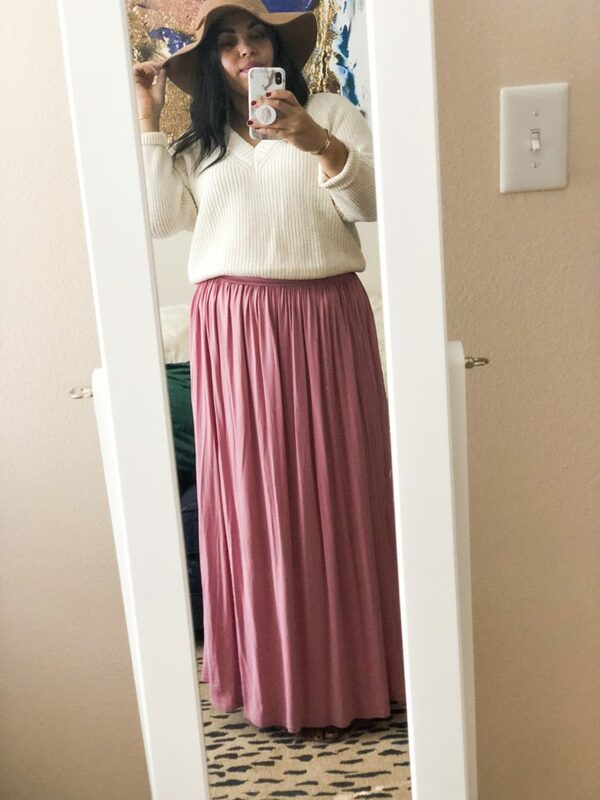 I love pairing maxi skirts with sweaters for fall, and the flowiness of this pairing makes the perfect outfit for Thanksgiving. Try tucking your sweater into your maxi skirt or tying a knot in your sweater for the perfect layering look. Love this easy, simple look for fall! 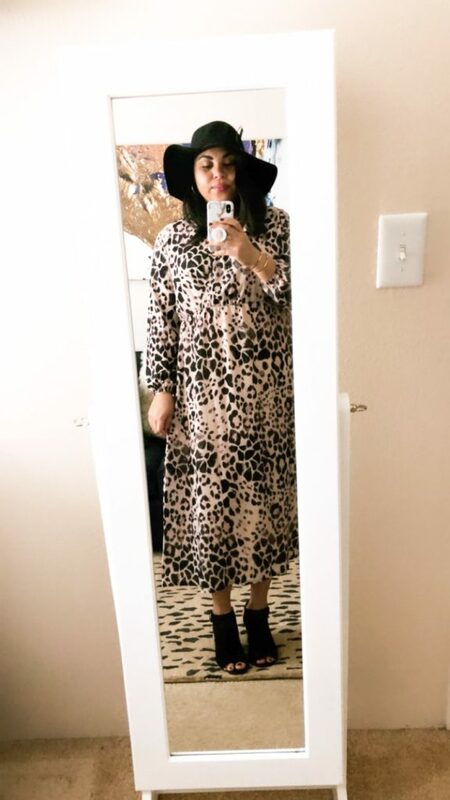 The leopard print dress I’m wearing is new, and I paired it with my favorite black booties and a felt hat to tie the look together. I also have a black pleather jacket that’s not pictured that would look cute + keep me nice and warm. If you’ve got a favorite dress, try wearing it with some of these fall staples for an adorable Thanksgiving outfit! 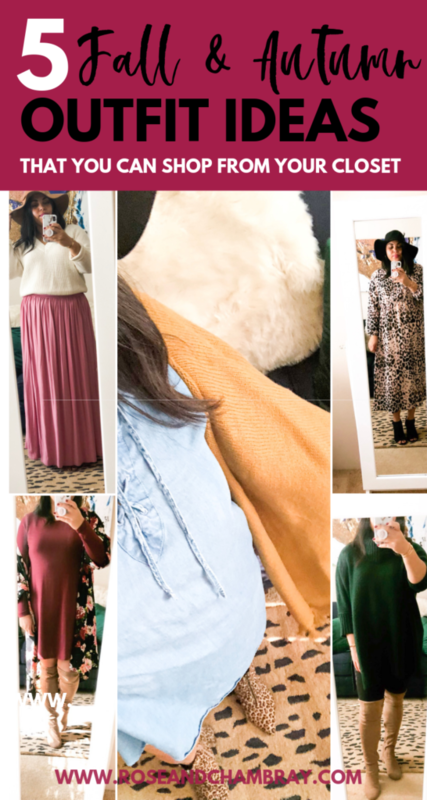 I hope you enjoyed this post, and feel inspired to shop your own closet this Thanksgiving and beyond! Doug and I are going out to brunch in Beverly Hills, and for the first time in years, I am not cooking. I’m leaning towards outfit number 5, but stay tuned on my Instagram to see what I end up wearing! 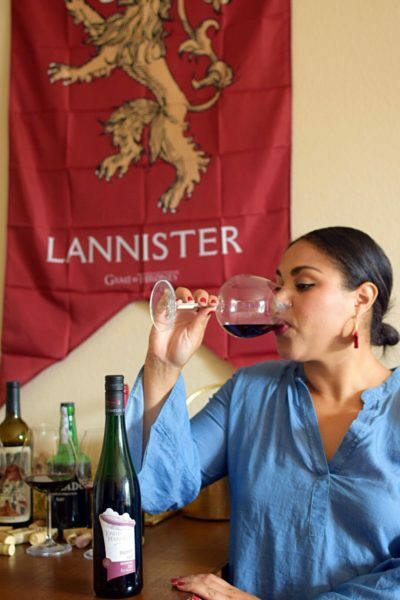 What are you up to this Thanksgiving? Thanks for reading and sharing! Happy Thanksgiving!